Universal's Added Tire Protection (ATP) enhances our standard 5 year manufacturer's defects warranty. The ATP program provides additional security by protecting your tires against any unforseen road hazards. Simply put, any tire that becomes unserviceable or sustains sidewall damage due to a road hazard will be repaired or replaced. If damage occurs or a defect is discovered, one quick call will have us dispatching FedEx to pick up your tire and return it to our warehouse in Hershey, PA. ATP even pays the cost of shipping to send the replacement tire back to you. Our Added Tire Protection covers your tires for the usable tread life or 5 years (whichever comes first). 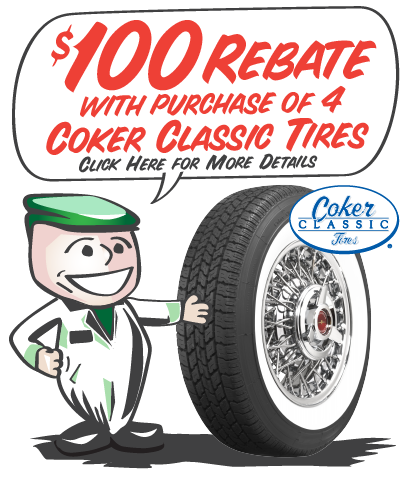 $10 per tire for tires valued up to $250. $20 per tire for tires valued up to $299. $25 per tire for tires valued over $300. Coverage: This Added Tire Protection Service Contract applies to the original purchaser recorded on the sales receipt from the purchase of the tires. Any of the purchased tires meeting the conditions set forth in this Service Contract that have become unserviceable or that has incurred whitewall damage due to cut, snag, bruise, impact or puncture caused by a road hazard not excluded in the following paragraph will be replaced, subject to all the terms and conditions of this Service Contract. As a part of this Service Contract, Universal Vintage Tire will pay FedEx charges to recover and replace any tire covered under this Service Contract. This Service Contract shall remain in force during the usable tread life of a tire or five (5) years, whichever comes first. Usable tread life is defined as original tread down to 2/32 of an inch of tread. During the first 25% of the tread life or the first fifteen (15) months the tire is owned, whichever comes first, any tire meeting the conditions of this Service Contract shall be replaced at no charge. During the remaining 75% of the tread life or forty-five (45) months of coverage, whichever comes first, any tire meeting the conditions of this Service Contract, shall be replaced with a new tire by charging a percentage of the current price equal to the remaining usable tread life or contract period, whichever is greater. Exclusions: Damage of any kind caused by the following is not covered: fire, theft, vandalism, abuse, collision, claims covered by insurance policy, defects of the vehicle, tire chains, misalignment, improper balancing and/or mounting, commercial usage, normal aging or other non-road hazard source. Other exclusions include tires used in any racing application, off road use, NOS and Blemished tires. Inquire for more information. Limitations of Liability: This is not a warranty. Universal Vintage Tire makes no representations that your tires cannot fail or become unserviceable. This Service Contract provides limited replacement of tires that fail because of a cut, snag, bruise, impact or puncture caused by a non-exclusive road hazard. Universal Vintage Tire's only liability is to repair or replace the tire as provided above. Universal Vintage Tire is only responsible for the terms of this Service Contract, and will not be responsible for any other implied conditions or terms. Universal Vintage Tire will not be liable for mounting, balancing or any other incidental or consequential damages. Owner's Obligations: Proper care is necessary to obtain the maximum mileage and wear from a tire. It is your obligation to see that your tires/wheels are in balance, that your tires are operated at proper inflation pressures and that your vehicle is aligned properly. Select one "Added Tire Protection" for each tire ordered.